A couple of events I am looking forward to next month– It would be great to see you if you are interested and can make it! Last week was the opening of Tending the Flames: Burnout and Resilience in Helping Professions exhibit, sponsored by Tri-C Gallery East, Tri-C’s Creative Arts and Art Therapy Program, Ursuline College’s Counseling and Art Therapy Department, and the Buckeye Art Therapy Association. The theme of this year’s exhibit is dedicated to how caregivers and helpers use art and the creative process to manage the stress and experiences related to this role, as well as nurture and strengthen resilience. If you are interested in learn more about the role of ecopsychology in art therapy and burnout, check out this True Calling podcast, Art Therapy, Ecopsychology, & Curing Chronic Burnout with Registered Art Therapist Lanie Smith or her post, Nature as a Portal to Self: How Eco Art Therapy Can Help You Reconnect and Heal. For this exhibit, my supervision group created a mandala inspired by this year’s theme, working on what we titled a “Self Care Compass”. Our image included a contribution from each of us about what helps guide our work and self care as art therapists. Themes of interacting with nature, practicing mindfulness, flexibility, and grounding ourselves in hope and growth were explored in our collective dialogue and expressed in the art we created together. Self care is an important, ongoing discussion in supervision, whether it is activating ways to take better care of ourselves, balance our daily lives and relationships with our work responsibilities and commitments, stay present and connected, or cultivate compassion satisfaction instead of compassion fatigue. My 2013 art journal about self care as an art therapist and trauma practitioner was also on display at the exhibit, focusing on themes related to gratitude, affirmation, strengths, and mindfulness in connection to facilitating trauma informed care. It was so inspiring to see all the works of art and creative expressions that filled the gallery in the spirit of the exhibit’s focus. If you are in the area and interested in checking out the exhibit, it is on display until March 22 and located on the Eastern Campus of Tri-C in Highland Hills, Ohio. Gallery East is in room 135 of the Education Center and open daily. Call 1-216-987-2475 for more information. 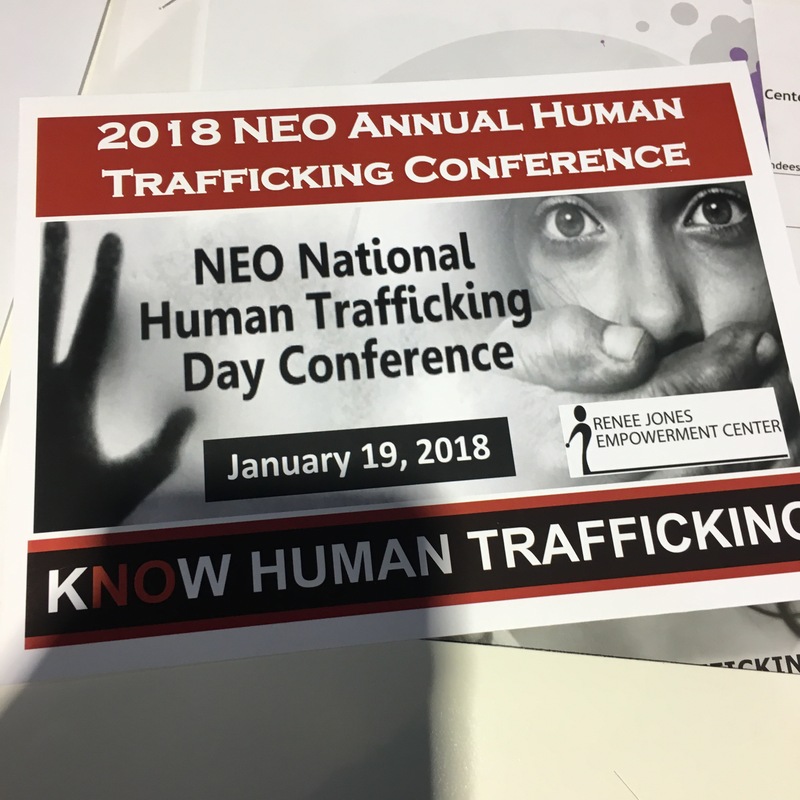 Last month I attended the annual NEO National Human Trafficking Day Conference hosted by The Renee Jones Empowerment Center. This yearly offering always is a valuable offering for mental health professionals, educators, advocates, law enforcement, and healthcare workers to gain important information and community resources about the realities of human trafficking in NE Ohio, prevention, programs, and services. Law Clinic– Case Western Reserve University law student Mercedes Gurney presented about the topic of her research, re-victimization of survivors and how criminalization of prostitution fails victims. Victims are coerced by perpetrators into prostitution and other illegal acts that they are often arrested for and charged with. You can learn more about the criminalization of human trafficking and issues victims face from this article and the Trafficking Victims Advocacy Project. When recovering survivors attempt to re-enter back into the community and start a new life, this legal trail of offensives and history of convictions can significantly and negatively impact employment, housing, and other aspects of recovery. This article, What Happens When a Human Trafficking Victim is “Rescued” also speaks to how re-traumatization can take place after someone leaves their trafficker and the lack of trauma informed care available to meet their needs. Ohio’s Safe Harbor Law allows victims of human trafficking to receive help for their criminal past and obtain legal services that would expunge and remove any previous convictions. This process creates a clean slate for survivors without their past impacting their ability to get a job, schooling, housing, or have a negative influence on future goals and opportunities. A portion of Mercedes’ presentation however, introduced the realities of expungement in the digital age and how physical criminal records can be erased and sealed, but there is no affirmative legal duty to update electronic information that becomes available through the Internet on websites, databases, digital newspapers, social media, media forums, or search engines. This means that someone’s expunged past criminal history (or even arrests where charges were dropped or unsubstantiated reports) can continue to live online for anyone who does a Google search for the individual’s name, such as an employer, landlord, etc. As we know, removing or regulating content published on the Internet is very difficult. Realize: Awareness to trauma reactions as normal reactions to abnormal situations and the effects of these responses emotionally, physically, cognitively, and behaviorally. Respond: Implementing a survivor approach that respects not only trauma as an experience, but that this experience is unique to each person, including any cultural, historical, or gender related ways of coping. Trauma informed responding also is aware the immense importance of safety, safety planning, and establishing safety as a core foundation to treatment. Trauma informed care also includes validating and empowering survivors towards recovery and healing. Recognize: Trauma informed work understands and sees the signs and symptoms of trauma. In relationship to human trafficking, this also includes the external and internal factors that put individuals at risk and vulnerable to trafficking. Resist: Trauma informed care resists systems, approaches, services, and practices that put survivors at risk for re-traumatization. Trauma Informed Services– This part of the conference focused on trauma focused services available to survivors at RJEC, such as equine therapy, art therapy, yoga, and counseling. I was honored to contribute to a panel of service providers to speak more about the value of art expression in trauma intervention and the art therapy group work at RJEC. I also learned more about trauma-senstive yoga, also known as TCTSY (Trauma Center Trauma-Sensitve Yoga), which is the first yoga practice to be evidenced-based for the treatment of trauma, especially for complex and relational trauma. The entire conference was a full day of knowledge…I continue to learn more about the complexities of human trafficking, services and programs available, and effective, trauma informed ways victims and survivors can receive help, hope, and healing. The next program offering I am looking forward to attending is the 2nd Annual Human Trafficking Awareness Youth Prevention Summit on March 23 at the Ohio Statehouse in Columbus. State Representative Teresa Fedor (District 45-Toledo) is again bringing students together from around Ohio to be a part of discussions about self-esteem and health, social media, legislation and highlight the role of students and young people in the fight to end all forms of trafficking. I will be helping offer an art experience for youth attendees to use creative expression as a form of advocacy and awareness against trafficking. Looking forward to another day of learning and awareness…. Last week the classic PBS TV show The Joy of Painting with host and artist Bob Ross celebrated its 35th Anniversary! The appeal and love of Bob Ross is stronger than ever for old fans and new, with opportunities to binge watch past episodes on Netflix, attend Bob Ross Paint-Along events, and new Bob Ross inspired products and artisan wears to get your daily dose of positivity and determination. The joys of Bob Ross are many for me: his calming voice, his words of encouragement and validation as he not only empowers the viewer with how to paint, but with language and experiences inspired by his creative process about life, making mistakes, choices, and enjoying the moment. Bob’s soothing tone, love of nature, and storytelling creates a safe and comforting space of acceptance. As an art therapist, I find myself sometimes channeling the spirit and referencing the words of Bob Ross with my clients, as an example of how to reframe mistakes, create our world, and be kind to ourselves and others. Read some of Bob Ross’ inspiring quotes here or watch this fun PBS remix capturing some of his iconic phrases and life lessons while painting on his show. And…. how perfect it was to be gifted the 2018 Bob Ross calendar over the holidays to be reminded throughout the year of his wisdom and share it with others! 🙂 An inspiring way to launch 2018! 1. Art exhibits: In 2017, I had the amazing opportunity to experience Yayoi Kusama’s Infinity Mirrored Room- The Souls of Millions of Light Years Away at The Broad when I was visiting Los Angeles. This summer, six of Kusama’s Infinity Mirrored Rooms are coming to the Cleveland Museum of Art. This is definitely a must do local creative field trip in 2018! Is there an exhibit or artist you want to see this year? 3. Saturday Art Nights- with one of nights dedicated to playing with alcohol inks and watercolor on Yupo paper. 5. Have an art movie night. 6. Organize my creative space and art materials, supplies- I realllly need to do this. 7. Blog more- One of my social media goals for this year is to begin regularly blogging more again! I’m trying out this editorial blogging journal to help support content, planning, and scheduling. 8. Replenish my magazine photo collage stash- I always find the process relaxing and inspiring! Made some progress on taking time to do this already! Doing another paper stash swap this year would also be fun! 9. Take a visit to Michael’s with my new giftcard. I would like to venture out for a visit to Blick this year too! 11. Bob Ross Art of Chill Board Game Playing- We recently played this during a Saturday art night and once we got all the rules and concept figured out, it was a fun time…. 12. Follow, connect to, and be inspired by more art, artists, creatives, and art communities/organizations on social media. 13. Learn a new art technique or media. 14. Discover new artist blogs and revisit my favorites. 15. Organize a local art therapist meet up to hang out, make some art, and have fun together! 16. Create a new creative offering online. 17. Remain socially engaged in arts and art therapy advocacy through reaching out to, visiting with, and building relationships with legislators, policy makers, and stakeholders. 18. Invite spontaneous opportunities for creative connection and mindful moments of creativity! What kind of artist dates, creative field trips, and artful adventures do you want to take in 2018? To celebrate the New Year, I am re-sharing one of my free and favorite e-workshops from a couple of years ago! How would you define your creative covenants? Your creative covenants are values that you believe are core to the way you create, practice, and live as a creative and artful being. When you know your own creative values, you can activate them to empower your creative life. In this e-workshop, you are invited to create an inspiring book made from a series of permission tags that honor these promises to our creative self and practice. Content in this workshop will also be nurtured through a series of prompts exploring what celebrates, challenges, and empowers the creative goodness in each of us! The holiday season is upon us: at home, in the workplace, in our communities, classrooms, and far and wide in the media, online, and in neighborhood stores. This time of year can inspire festive gatherings and activities of joy, togetherness, and heartfelt memories with family and friends. For some, though, the holidays can be a challenging time of stress, adversity, and a difficult trigger of strong emotions, pressures, or traumatic experiences. This topic is the focus of my new guest post for The National Institute for Trauma and Loss in Children’s (TLC) blog, helping to provide a trauma informed considerations for the holidays and additional resources to learn more. Read more here.